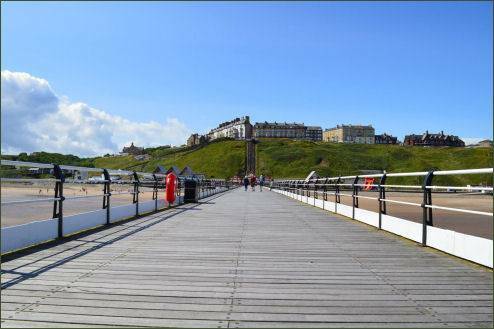 The charming Victorian seaside resort town of Saltburn lies around 12 miles (19 km) to the east of Middlesbrough. 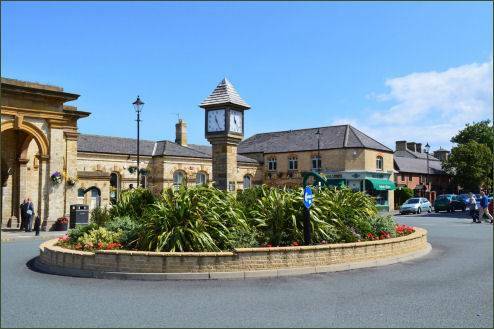 The town developed due to the discovery of iron stone in the Cleveland Hills and to the money of the wealthy Pease family of Darlington. The original settlement is Old Saltburn (pictured left), which straddles Skelton Beck. In the Roman era a fortified signalling station stood on the coast, while evidence exists to suggest a hermit once lived here in Roman times. Once a centre for smugglers, publican John Andrew was known as 'king of smugglers'. In 1856, it comprised of but the Ship Inn, which stands by the shore and dates back to the seventeenth century, as well as a row of fishermen's cottages. The Ship Inn still stands today and has acquired a well earned reputation for serving delicious home made dishes. 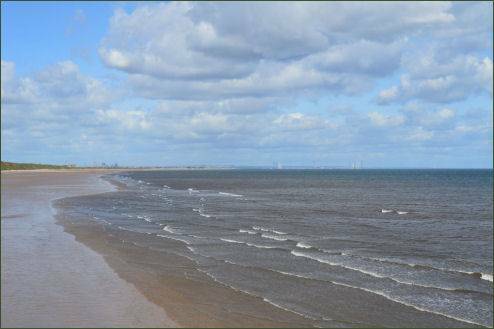 The Pease family developed nearby Middlesbrough as an industrial centre and, after discovery of iron stone, the Stockton & Darlington Railway and the West Hartlepool Harbour and Railway Company developed routes into East Cleveland. By 1861, the Stockton &Darlington Railway had arrived at Saltburn. 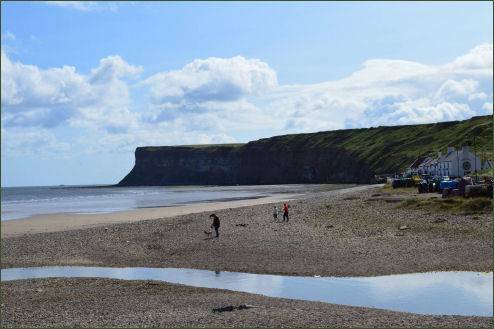 In 1858, whilst walking along the coastal path towards Old Saltburn to visit his brother Joseph in Marske, Henry Pease, a local entrepreneur and respected MP, claimed to have seen a vision of a town arising on the cliff with the quiet and sheltered glen turned into a lovely garden. The Pease family developed Henry's vision by forming the Saltburn Improvement Company. As many houses as possible had views of the sea, the design was added to by the so-called Jewel streets along the seafront-Coral, Garnet, Ruby, Emerald, Pearl, Diamond and Amber Streets. 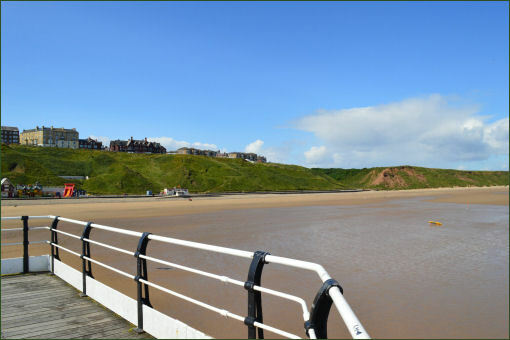 The sand and shingle beach has the benefit of a lifeguard service and Saltburn has also become a popular centre for surfing in recent years. 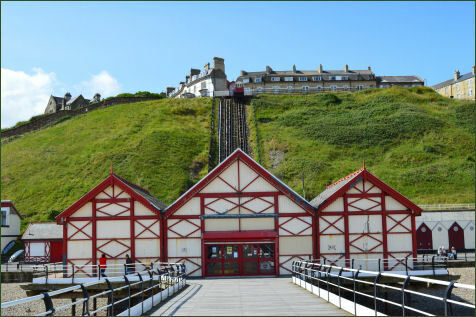 The Saltburn Cliff Lift (pictured right) is one of the world's oldest water-powered funiculars it rises up 120 feet on a track of 207 feet and links Saltburn pier and the lower promenade with the upper promenade and the town. 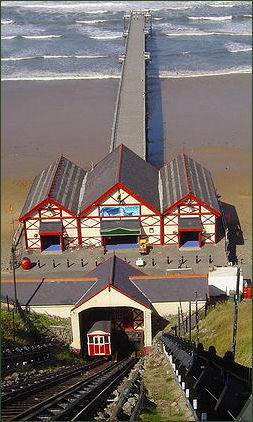 Saltburn Pier opened in 1869, is the most Northerly surviving British iron pier. 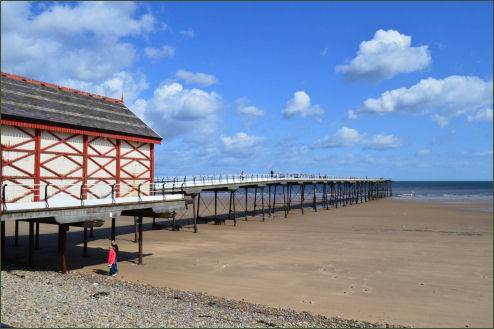 The Pier is a Grade II renovated structure and claims the distinction of being the only pleasure pier on the Yorkshire coast. After the opening of the pier it was realised that the steep cliff walk was deterring people from walking from the town to the pier. The town also has a number of Victorian buildings. There is also a local theatre, The 53 Society, and a public library. A forest walk in the Valley Gardens leads on to the colourful Italian Gardens (pictured left) and to the railway viaduct. Saltburn Valley Gardens and Woodland Centre are well worth a visit. 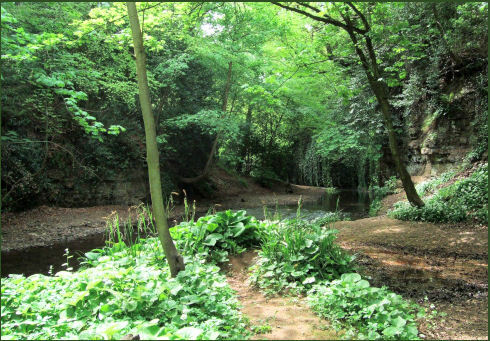 The Woodland Centre provides information on local walks. The Gardens offer tea rooms, a miniature railway, Italian Gardens flower beds, and the ruins of an old corn mill. 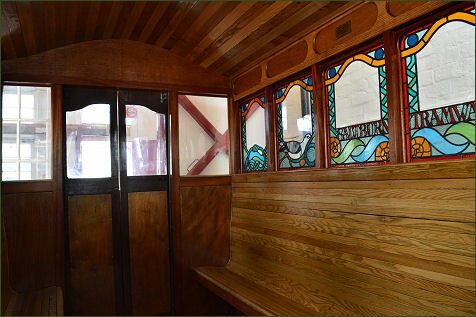 The popular Saltburn Miniature Railway is a 15 in (381 mm) gauge railway which runs south from Cat Nab Station close to the beach, for about ½ mile inland to Forest Halt. Teddy's Nook is a sandstone house built in 1862 by Henry Pease, a director of the Stockton and Darlington Railway, for his own use. Pease was responsible for the foundation of the seaside resort . Lillie Langtry stayed at the house at sometime between 1877 and 1880. She was often visited there by Edward Prince of Wales (the future Edward VII), who stayed at the Zetland Hotel, a railway hotel complete with its own platform, hence the house came to be known as Teddy's Nook. Wherever you choose to wander there are walks in the region to suit everyone. The Cleveland Way passes through along the coastline and continues up a steep path to Huntcliff, once the site of a Roman Signal Station.